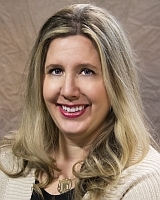 Debra Dudek, a genealogist and a librarian, will present her lecture “Aliens in the Army” at our 2018 Fall Conference on Saturday, October 27. We talked about her new book, World War I Genealogy Research Guide, genealogy, and the upcoming conference. Check out Debra’s interview below! 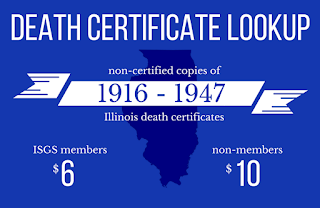 Illinois State Genealogical Society: How did you become interested in genealogy? Debra Dudek: My grandmother and her sisters (Aunt Clara, Aunt Loretta, and Aunt Betty) were always very keen on family history. I loved sitting at the table with them having tea and talking about their family. They were very proud of their roots, as their mother, my great-grandmother (Grandma Rhodes) was from Scotland while most of their father's family (Grandpa Rhodes) had been America since before the revolution. They shared so much information in a very interesting way. Even when I was young, I recognized this was something magical. I was my grandmother's family research assistant, licking the stamps on the correspondence she sent out and going to the mailbox to see what had arrived. In the years before online genealogy research, grandma and the aunts relied on a lot of personal correspondence, family documents, and self published books to confirm information. How long have I been researching? I count most of my childhood as one long apprenticeship. After I began studying genealogy as part of my graduate school library coursework, I started pursuing the "cite your sources" methodology of genealogy research. ISGS: Who is your favorite person (ancestor or otherwise) to research? Why? Debra: Hands down, my favorite person to research is Adam Poole Vandiver "The Hunter of Tallulah". My 5th great grandfather was a larger than life figure who definitely needs his own segment on Comedy Central's 'Drunk History'. He's a cross between Gaston from Beauty and the Beast and Deadpool. A prodigious explorer, hunter, veteran of the Indian Wars during the War of 1812, and reputedly had over thirty children with three different wives, though not all at once. What I love is his interview with a travel writer from the Flying Intelligencer who described Vandiver as a "short, one-eyed, grey eyed man with a weasel face" who couldn't stop talking. I think that trait was passed down to me! ISGS: What has been a defining moment in your career as a genealogist? Debra: For me, it's about helping others as much as it is making headway into my own past. I feel successful each time I'm assisting patrons with their research and helping them through the genealogy process. When I talk to those patrons later, they always talk about how much they've learned and how their family has grown as a result of taking up the mantel as the family genealogist. Having the opportunity to help others has been a really worthwhile process, and I owe those experiences to the supportive administration and staff at my library. ISGS: What are you most looking forward to at the ISGS annual fall conference? Debra: Conference is always a social whirl for me. It's a lot like being back in school, but this time, you like everybody who's sitting in class with you. I always learn a lot of new things, and I always feel like my research gets a boost after attending ISGS. ISGS: What should conference attendees look forward to at your lectures? Debra: Enthusiasm and a bit of stand up comedy. I have a motto of 'no boring lectures.' It's worked pretty well so far. ISGS: In what ways are you expanding your knowledge in the field of genealogy? Debra: I let my curiosity be a guide to finding new areas to research. Whatever sounds fun and interesting is a great measure as to what topic I'll tackle next. I should probably say curiosity and referrals, as some of my friends send records to me by e-mail or on Facebook, and they lead me to tackle projects I wouldn't have known existed. I also tune into to a lot of free online webinars. ISGS: Why do you research your ancestors? Debra: I research genealogy because it makes me feel connected to my family in a way that is tangible and meaningful. I know my place in the family, and I can see what people have done before, and I'll continue to document what people are doing in the present. Whatever I document and cite today makes someone else's job easier in the future. Plus, I'm incredibly nosy. I love accepting a seemingly impossible challenge, exploring every avenue, and coming up with pay dirt. I just found a death date for my 4th great grandmother Mourning Wheeler Vandiver in an Old War Pension File for her husband Alexander N. Vandiver (son of the infamous hunter). Finding a death date for a woman from Georgia from the 1870's without a headstone is a huge victory. I've been burned by pension files in the past, but in this case, Christmas arrived early! ISGS: Is there a genealogist or a historian that you look up to? Who and why? Debra: Tina Beaird. She's an amazing researcher. Through, precise, and she explains things in a way I can always understand. She also makes me laugh. ISGS: We're celebrating the Illinois Bicentennial and the 50th anniversary of ISGS this year. What are some of your favorite resources for Illinois research? Debra: I always use the Try-It! Illinois databases which is available each October 1 - November 30 online at http://www.finditillinois.org/tryit/. This trial site used to host an amazing array of genealogy databases, but I've noticed the vendors have cut back on their offerings a bit. Still, I encourage all Illinois residents to give it a try. ISGS: What is one of your favorite events or figures in Illinois history? Debra: Abraham Lincoln. One of the best presidents ever. If I had to give a close second, it would be Nora Bayes, the Chicago-born vaudeville actress and singer who performed "Over There" on the original George M. Cohan recording. She posed for the photo on the first sheet music cover. Talented, business savvy, and endlessly interesting. She doesn't get enough credit for the hearts and minds she won during the Great War. ISGS: You're the Head of Adult and Teen Services at the Fountaindale Public Library District in Bolingbrook, Illinois. How does your career as a librarian make you a better genealogist? Debra: I always learn something new during each of my patron genealogy sessions. Helping others with their research really allows you to flex your mental muscles and grow your skills. As a librarian, I'm really blessed. In the hundred odd genealogy queries and appointments I field each year, I'm always learning something new and putting those lessons into practice later. Using some of the skills I learned helping connect adoptees with their birth families, I was able to track down an urgent request to locate the whereabouts of the first corporate female airline pilot in Illinois for a documentary program. ISGS: You recently wrote a book! Tell us about your experience writing and publishing World War I Genealogy Research Guide. Debra: Writing my guidebook was was one of the most intense and rewarding projects I've taken up as a genealogist. I had planned to work on the guidebook at the end of my longer World War I non-fiction narrative "Some Place Not Far From Terror". My narrative was taking a bit long than I expected, so my editor suggested finishing the guidebook first to connect genealogists to the World War I centennial. ISGS: Why did you choose to write about WWI? Debra: I inherited what I thought was my great grandfather's Great War diary, but when I began to transcribe it, I discovered it belonged to a totally different person from a completely different country. From that point on, World War I became my bright shiny genealogical object. The more I researched, the more I realized how underappreciated the Great War is to modern researchers, and it has led me to stretch out and pursue subjects like Old War pensions and 1900-1920 documentation processes in general. There's so much going on during the Great War, and I would love to see the topics and history associated with that time period presented in schools and to the public in a more proactive fashion. Deb's Writing Tip: Join Nanowrimo (https://nanowrimo.org/) this November! Yes, the title means National Novel Writing Month but you can write whatever you want. Your goal is to write 1,600 words a day for month of November, totaling a 50,000 word project. It doesn't have be be perfect. This is a writing draft session, not a finished project! You can join a local community online and meet up with other writers in supportive and creative environments. I made so much headway on my non-fiction narrative and guide book that I was able to publish my finished project by May. There are write-ins, fun activities, and lots of prizes! If you're looking to start your family history narrative or another writing project, join Nanowrimo! It's free! The 2018 Fall Conference will be held October 26 and 27 in Springfield, Illinois. Discover more information in the conference brochure and register online.